Water District 17 currently maintains over 2,000 fire hydrants. These hydrants are typically located every 500 feet in populated areas. Fire hydrants are directly connected to the water supply system through the mains in the street and can be turned on and off using a street valve. 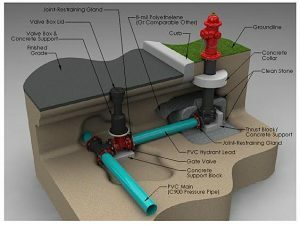 Pictured is a typical hydrant installation showing piping under the street. There are two types of fire hydrants, wet barrel and dry barrel. Because of the possibility of freezing temperatures, District 17 uses dry barrel hydrants. The hydrant is dry because the plunger, which opens and closes when the stem is turned, is located underground at the main level. When the hydrant is closed, the water in the barrel drains out of the hydrant into the ground. When the hydrant is open the drain closes off and the water fills the barrel. The best way to convey this important information to our fire fighters is to paint the hydrant tops and caps using standardized color codes. These colors provide a reasonably accurate picture as to how the hydrant should perform. Water District 17 fire hydrant bodies are painted reflective silver so they can be easily seen at night, and the caps are painted according to flow rate as required by the fire code. To get adequate flow through a fire hydrant, the system needs to have a minimum water main size of 6” in diameter. Most areas in District 17 have 6” or 8” mains; however, there are some small areas which still have the old 4” mains. District 17 replaces and upgrades some of these mains every year. One of the routine operations performed by District 17 staff is the annual inspection and maintenance of District owned fire hydrants. This routine maintenance includes: lubrication of the operating stem and nozzle caps, water pressure recording and operation of the fire hydrant to ensure adequate flow and pressure. Fire hydrants are also repainted at this time. In addition to these routine procedures, District crews observe the general condition of the fire hydrant which includes the availability of proper access to the hydrant for maintenance and emergency purposes. Lake Travis Fire Rescue (LTFR) must have unimpeded access to connect hoses and equipment in routine maintenance and emergency situations. Fire Department regulations require that all fire hydrants be clear of bush, fences, posts, decorative landscaping, and other obstructions a minimum of 3 feet to the rear and on each side of the hydrant and full clearance in front. The District and the LTFR request your assistance maintaining this clearance, should you have a fire hydrant located on or adjacent to your property. Because fire hydrants are connected to the public water supply, it is illegal for any unauthorized person to open, connect to, or otherwise tamper with a hydrant in any way. It is also illegal to take water from a hydrant without the proper backflow prevention devices and a meter from the District. Heavy fines are levied for these activities. 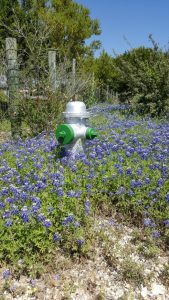 If you see any suspicious activity around a fire hydrant or you suspect a fire hydrant might be leaking, please call the District 17 office at (512)266-1111 or after hours call the emergency number of (512)537-8302 to report.